Precious metals futures traded lower in their start to the new week on Monday. Losses ranged for less than 0.1% for gold to 1.2% for palladium. Gold for April delivery dipped 80 cents to settle at $1,336.50 an ounce on the Comex division of the New York Mercantile Exchange. The settlement was the lowest since Jan. 22. "A bit of safe-haven demand was featured as world equity markets are selling off, led by strong down-moves in the U.S. stock indexes," Jim Wyckoff, a senior analyst at Kitco Metals Inc., said in a report. "However, a rally in the U.S. dollar index to start the trading week worked to mitigate buying interest in the precious metals markets." Gold futures traded from a low of $1,331.60 to a high of $1,341.30. They slipped 1.1% last week. Silver for March delivery lost 3.8 cents, or 0.2%, to settle at $16.671 an ounce. The close was the lowest since Dec. 26. Silver futures ranged from $16.51 to $16.87. They sank 4.2% last week. April platinum declined $3.90, or 0.4%, to $995.50 an ounce, trading between $990.50 and $1,000.60. Palladium for March delivery fell $12, or 1.2%, to $1,032.95 an ounce, ranging from $1,028.15 to $1,045.85. Both metals fell last week with losses of 1.9% for platinum and 3.7% for palladium. Gold added $2.45, or 0.2%, to $1,333.60 an ounce. Silver declined 26 cents, or 1.5%, to $16.875 an ounce. Last week, LBMA precious metals prices registered losses of 1.6% for gold, 1.5% for silver, 2% for platinum and 3.7% for palladium. United States Mint bullion sales advanced by 1,000 ounces in gold coins and by 225,000 ounces in silver coins. Below is a sales breakdown of U.S. bullion products with columns listing the number of coins sold during varying periods. 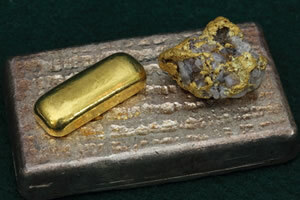 This article was edited to include updated U.S. Mint bullion figures.